Our first afternoon in Old Dhaka was spent with our guide Jewel. He had a limited repertoire, so we followed him to the three destinations that he knew. Despite our usual reticence to follow guides, I had convinced Yann to follow him. The main reason for me wanting to follow him was the belief that it might cut down our time in the heat. 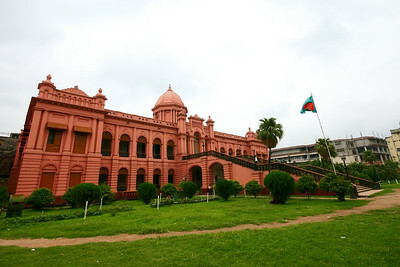 We stopped first at Ahsan Manzil (or the Pink Palace), one of Dhaka's lovelier buildings, a short walk away from the main boat terminal. I was too exhausted to walk up the stairs of the palace, so I hid in the shade while Jewel and Yann visited the museum inside the palace. My rest was interrupted by requests for photos with me, and I spent most of the time in the sun posing, until a guard shooed everyone away. The three of us then hopped on to a rickshaw to the Sitara Mosque, a lovely little mosque a short ride away. The mosque gates weren't open but with a little shouting by Jewel we were let in for a private visit. The mosque is completely covered in mosaic, some parts restored by a rich donor (using Japanese and English china) and other parts original. Each of the four mosque towers are tiled in white and scattered with blue mosaic stars. We were warmly received by the caretaker who showed us Mount Fuji on the Japanese tiles. We weren't as lucky finding the caretaker of the imposing Armenian Church. We had to content ourselves with views from outside the gates. Our last stop with Jewel was Shankharia Bazar, more commonly known as Hindu street. One of the last enclaves of Hindu craftsmen (shankharias) in Bangladesh. This narrow, rickshaw-packed street is home to dozens of tiny workshops. 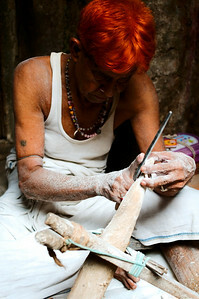 In our short visit we saw artisans making harmoniums from scratch and an old man carving bangles from conch shells. Shortly after we parted ways with Jewel. Partly because we were exhausted and partly because he had a head-on collision with another pedestrian. This left him very much confused with a huge gash above his eye. Despite Jewel's earlier promises, he demanded twice the price that we had agreed to pay for his guide services. This wasn't particularly surprising, but was disappointing nonetheless. By the time we arrived back at the hotel, the heat rash that had appeared after our train ride from Delhi to Kolkata had pretty much covered most of my body. We had spent our first night in a room without air-conditioning, but after seeing my heat rash, Yann agreed that it might be beneficial to have it. This doubled our hotel bill, but was enough to get my skin back to a somewhat tolerable state. We had failed in our attempt to withstand the Bangladesh summer without using air-conditioning. It felt extravagant in a country with a dire lack of power. Millions would be attempting to get a good night's sleep without even an operational fan. 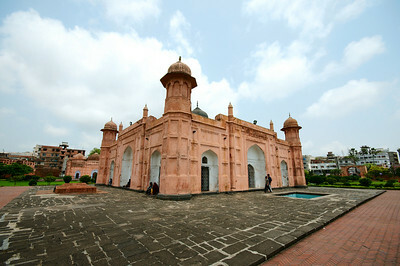 On our second day in Dhaka, we decided to tackle the city without the use of a guide. This required special planning due to adorable but extremely annoying "English speaking" rickshaw guides that hovered around our hotel entrance trying to sell us their full day tours. We left with an old gray-bearded rickshaw driver, who we knew would end up costing us more than it should because he was cute and skinny. He got us to the ruins of Lalbagh Fort, one of Dhaka's main attractions, elsewhere it probably wouldn't be given much visiting time, but in Bangladesh, the sights are few and far between, and we wanted to make sure to give them our full attention. We spent a few hours roaming around the unshaded grounds, there isn't much left of the fort, but the grounds are well kept, and we felt sheltered from the noisy and crowded city that surrounded us. After the quiet of Lalbagh, we headed back into the heart of Old Dhaka for a visit to Bicycle Street. We had no problem explaining this site to our rickshaw driver, its the city's headquarters for everything Rickshaw. 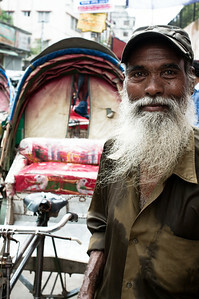 Each shop specializes in some aspect of rickshaw making and repair. But what we were really there for was the rickshaw artwork. 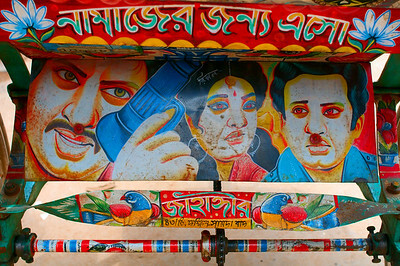 Nearly all of Dhaka's 400 000 + rickshaws are adorned with colourful artwork, on the seat, or as a back bumper-like flap. Basically every possible surface of the rickshaw has some painted metallic cut-out, plastic streamers of fake flowers attached to it. Popular themes include: the Taj Mahal, bloody Bangla movies involving big women and big guns and the serene cabin-in-woods scene (this one is actually quite sad, because it is exactly the opposite of everything that is Dhaka). We caused quite a commotion on Bicycle Street when we pulled out our cameras. Every single shop-owner, pedestrian, child wanted a photo taken of themselves. 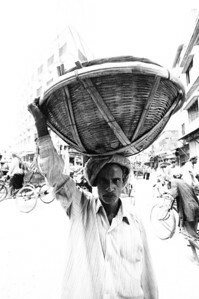 Men carrying heavy loads on baskets balanced on their heads would stop and insist that we photograph them. We could have spent the entire day there and the requests would have never stopped. In the late afternoon we headed to the sombre "Museum of Liberation" celebrating Bangladesh's bloody civil war with Pakistan (then West Pakistan). The country is extremely proud of its stand to protect its language rights, which were at the core of the conflict with the Urdu-speaking West Pakistan. We met a young man later who summed up his thoughts about his country: "We are very poor, we don't have very much, but we have two things, we have our beautiful language, and we have our religion". We had successfully navigated ourselves through the incredible chaos of Dhaka for a complete day of sight-seeing, despite our inability to utter a single word in Bangla. In fact, our initial plan of bargaining for prices with a calculator was quashed on our first negotiation, when we realized that Bangladesh does not use the same number system as we do (this is actually the first country where we experienced this). So despite most of the rickshaw drivers unable to speak English (and many illiterate) we relied entirely on the help of strangers to help us get around. Actually we never even had to ask anyone for help. Within seconds of flagging down a rickshaw driver we would be surrounded by a crowd of onlookers, the best English speaker of the bunch (usually not too great) would somehow figure out where we wanted to go, explain it to the driver AND negotiate the price for us. Often the crowd would be arguing with the driver in our favor. Without fail, every time we needed to get somewhere, someone would appear to help us. We had a wonderfully pleasant day, despite the hot humid weather. Hi Guys!!! It's that annoying kid who always visited you two in your respective offices. This website makes me simultaneously swoon with awe and tremble with jealousy. When I'm an old man like you (points at Yann), I think that I'll have to start a competing website: le-travels. Anyway, did you guys catch the solar eclipse?